Four days after Yom Kippur, Jews world-wide celebrate the holiday of Sukkot. The holiday is celebrated from the 15th of Tishri through the 21st or 22nd of Tishri, depending if you live in Israel or in the Diaspora. Sukkot usually falls out in late September or early October. In addition, because of its strong agricultural elements, some scholars believe that the current custom of building your own sukkah stems from the harvest when workers would live in temporary huts in fields. They argue that our sukkot with their open roofs bear more resemblance to the harvester’s huts than they do with the dwellings the Jews lived in the desert. Sukkot is a happy holiday. In biblical times, Sukkot was considered to be the most important festival. It was actually referred to as ha-chag, the festival, (Kings 12:32). King Solomon chose Sukkot as the holiday during which he consecrated the first temple. It was also the occasion every seven years for the ceremony hak’heil, the public reading of the Torah before the whole people (Deuteronomy 31:10-13). Sukkot is also said to be the festival of the future, when in the messianic period, all nations will come to Jerusalem and celebrate. The only time celebrating Sukkot was suspended was during the Babylonian exile since the holiday was so connected to rejoicing at the temple and harvesting the land. During the next century, when the Jews returned to Israel under the leadership of Ezra and Nechemia, they were ready to embrace the Torah’s commandments. The Jews, ecstatic to be reunited with the land, built sukkot out of olive, pine, myrtle, and palm branches. The importance of Sukkot continued during the second temple era, with pilgrims coming to Jerusalem from Jewish communities all over. They participated in praying and singing and joining in the religious processions. 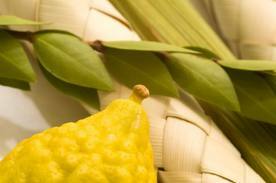 The etrog and the four species- palm, willow and myrtle, which are bundled together to make a lulav – became part of the ritual. Simkhat Torah: As life in the Diaspora continued, it became customary on the second day of Shemini Atzeret, to remove torah scrolls from the ark and circle around the bimah, the traditional stage located in the center of the synagogue where the Torah is read. Named Simkhat Torah, rejoicing with the torah, the custom became its own holiday, especially for children, with dancing and singing in the synagogue and festive meals at home. In Israel, Shemini Atzeret and Simhat Torah are celebrated together on the seventh day of Sukkot. In modern times, the custom of building sukkot was reestablished in the early 1900s. Since then, Jews everywhere celebrate the seven or eight days of Sukkot, (depending where you live) including Shemini Atzeret and Simhat Torah from the Diaspora and from Israel.